Sovereign Cast Iron Radiators are an inspirational range of the most traditional designs of cast iron radiators. With a 25 year guarantee, these castings are some of the best available in the UK today. Using original moulds, these castings have been manufactured for over 50 years and have quite simply never gone out of fashion. Every Sovereign cast iron radiator is manufactured and tested to the highest possible standards ensuring that they are better than asian castings. 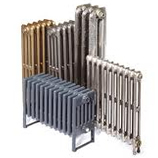 Because the casting tollerance is better than asian imported castings, rather than silicon gaskets, Sovereign Cast Iron Radiators have traditional paper gaskets meaning that the assembled product is uniform and flawless. 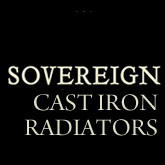 Sovereign Cast Iron Radiators are cast in Europe and assembled in the UK to your exact requirements - be sure to ask for Sovereign Cast Iron Radiators - nothing else is quite the same!